Benita McGinnis and her classmates in the 1908 Women’s Life Class of the Art Institute of Chicago were anything but shrinking violets. Women’s Life Class Party. Benita McGinnis is at top row, second from right. Art Institute of Chicago, 1908. From Benita (McGinnis) McCormick’s scrapbook. In fact, I suspect that many of them were like my maternal grand aunt “Detty” and were forward-thinking young women, ready to take their rightful place in the world rather than stand in the shadows of the male-dominated society of the time. The scene takes place just after noon. We see Aunt Detty, her classmates, and their slightly bemused professor, as they celebrate some occasion with daring and gusto, eating chocolate cake, drinking red wine, and even smoking. The mood in the room is playful yet bold and defiant. 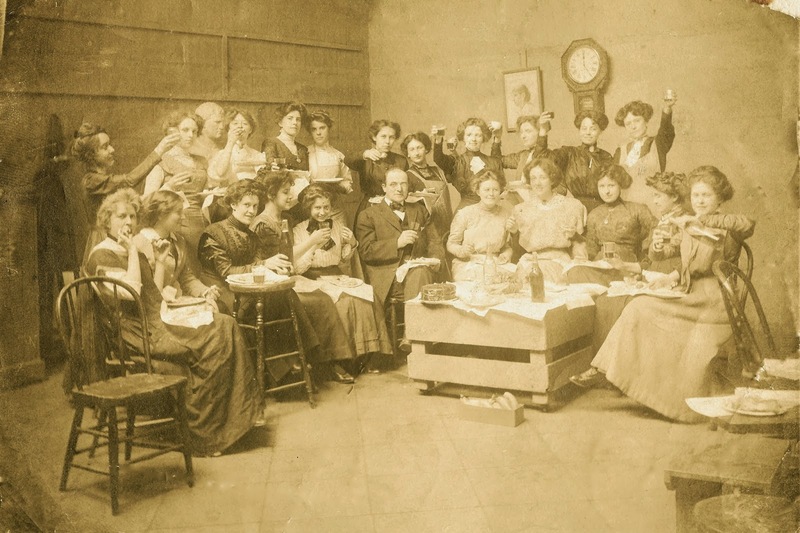 Aunt Detty, raising her own glass triumphantly, stands in the back row, second from the right. Just what the occasion was on that day in 1908 is a mystery. Perhaps not coincidentally, though, on March 8th of the same year, thousands of women in New York City marched in the streets to demand equality and fair working conditions in what would one day be called International Women’s Day. Two months later, hundreds of women in Chicago showed their support. It would not be unthinkable that the Women’s Life Class decided to join in the fervor of the time in their own audacious way. Oh, to be in the room with them!